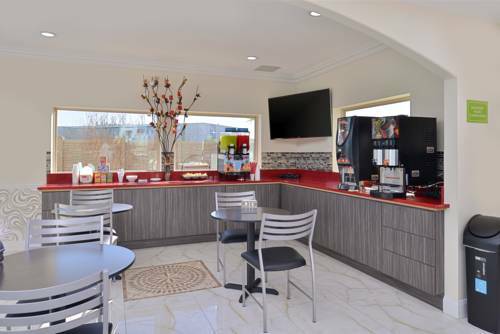 Americas Best Value Inn and Suites Houston/Highway 6 and Westpark is a brand new modern style hotel with fresh Southwest designs. We offer the most value for your money when staying for business- pleasure- or just passing through. We offer beautifully decorated rooms and suites with modern furnishing and amenities- a 24-hour front desk and lobby- free coffee in lobby- free continental breakfast- business services- and free Wi-Fi throughout the property. Our guest rooms and suites include microwave- mini-fridge- hairdryer- 50 inch flat panel satellite TV- HBO- ESPN- iron- ironing board- and clock radio. Take advantage of our extremely comfortable beds and relax while saving money year-round with our Kids Stay Free Policy -11 and under in parent-s room-. For your convenience- our hotel offers both smoking and non-smoking rooms and suites. Sorry- no pets allowed. We are located off Westpark Tollway on Highway 6 South -Addicks-Howell Road-. We are near several local attractions such as FUNPLEX Amusement Center- Houston Museum of Natural Science at Sugar Land- and Downtown Aquarium. Americas Best Value Inn and Suites Houston/Highway 6 and Westpark is your best choice within the Texas-Oklahoma boundary. We offer ideal accommodations and location whether you are in town for fishing- shopping- entertainment- or music and food festivals. At Americas Best Value Inn and Suites Houston/Highway 6 and Westpark our goal is to provide our guests a great experience- not just a place to stay. Americas Best Value Inn and Suites Houston/Highway 6 and Westpark is located off Westpark Tollway on Highway 6 South *Addicks-Howell Road*. We are near several local attractions such as FUNPLEX Amusement Center- Houston Museum of Natural Science at Sugar Land- and Zuma Fun Center. Our address is 3302 Highway 6 South- Houston- TX 77082.